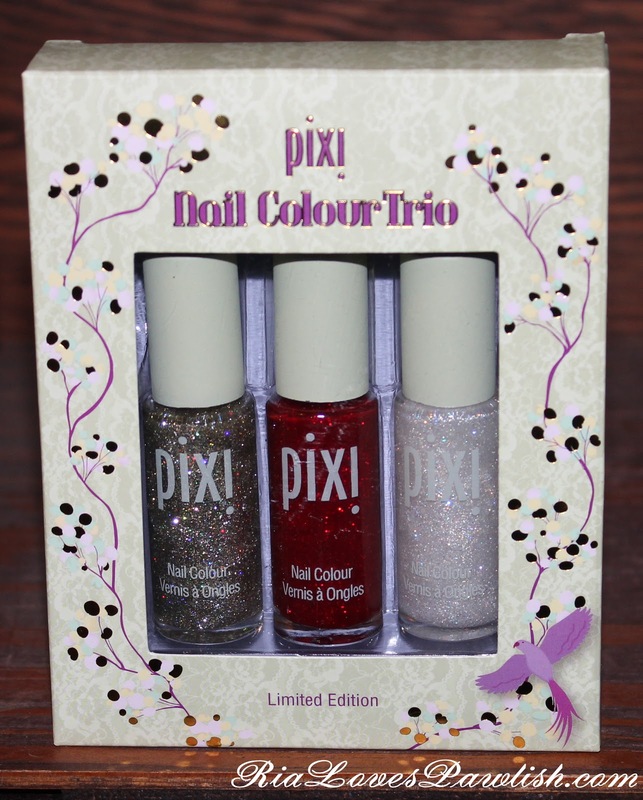 Ria Loves Pawlish: Pixi Holiday Nail Colour Trio! after yesterday's overview of the Pixi Holiday Kits, i wanted to bring you swatches of the Nail Colour Trio today! there are two glitters and one shimmer that can all be used alone or combined for different looks. it retails for $12, which is an amazing deal since one Pixi polish usually retails for $8! i took another picture of the packaging, this time there is no reflection so you can more see the actual colors :) i just love the little bird! 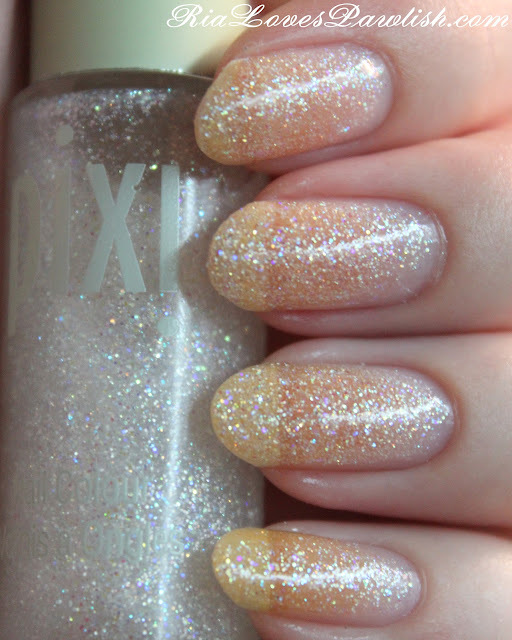 first up is Gold Glimmer, a dense gold glitter with holographic silver pieces. 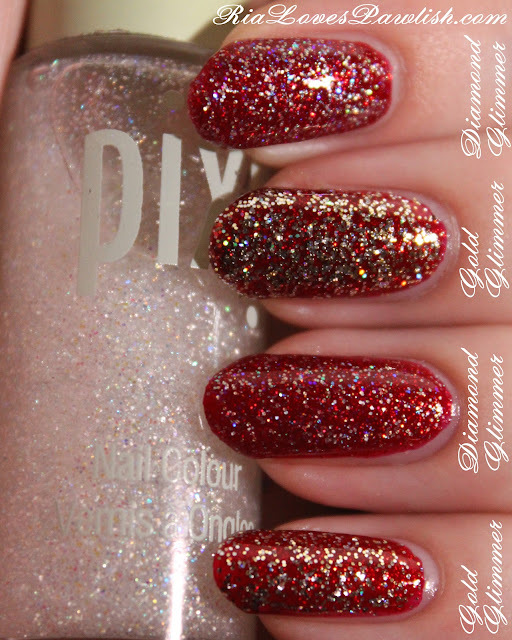 the glitter is so dense that it is opaque enough to wear on its own in two coats! it also dries quite smooth, so i didn't even add a topcoat... but adding one would help out the longevity of your mani. 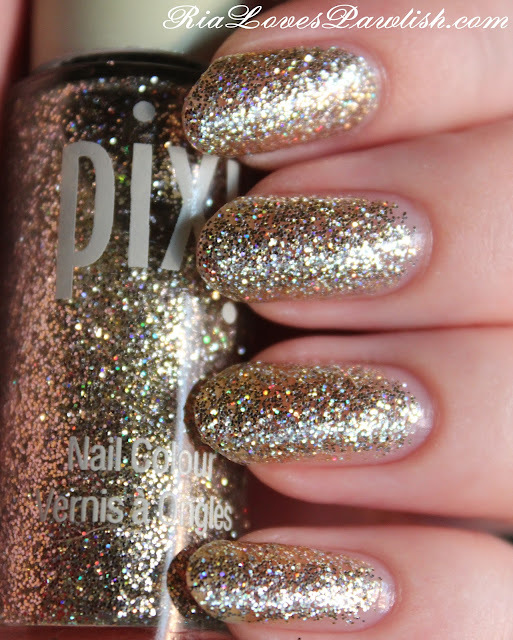 since glitter polishes are made up of separate piece, it makes it easier for bits to chip off. Gold Glimmer makes your nails look like they are covered in gold gilt, and the holographic particles add extra visual interest. this is a perfect party polish! next up is the other glitter, Diamond Glimmer. this one is chock full of iridescent glitter pieces! i think it would be nearly impossible to get it fully opaque on its own; however, it make for a really elegant mani all by itself. for this swatch i used two coats, which was enough to obscure my natural nails, but not cover them. this would be stunning over french tips! it dries slightly dull, so you'll want to add a shine topcoat. two coats Diamond Glimmer, one coat Seche Vite. two coats Ruby Glitz, one coat Seche Vite. and here's what it looks like to combine the polishes! Diamond Glimmer definitely gives a more subtle effect than Gold Glimmer over Ruby Glitz. one coat Gold Glimmer on pinky and middle, one coat Diamond Glimmer on ring and pointer, everything finished off with one coat of Seche Vite!